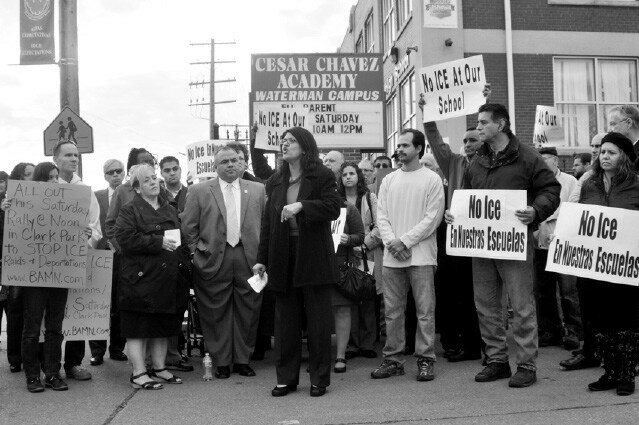 School of America Watch – Civil Disobedience. 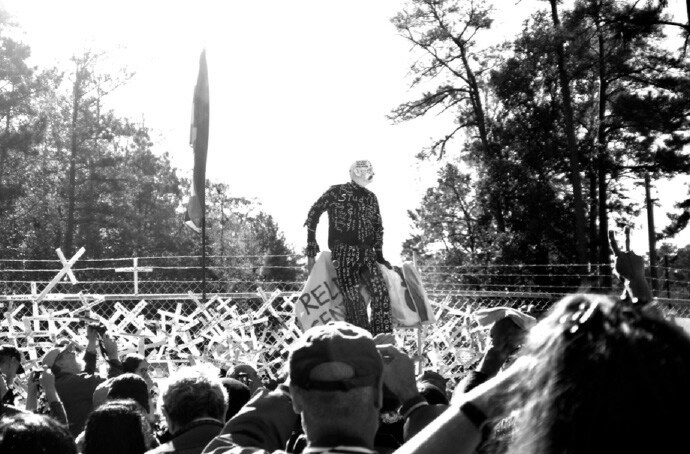 Nov. 18th, 2012, Fort Benning, Georgia. 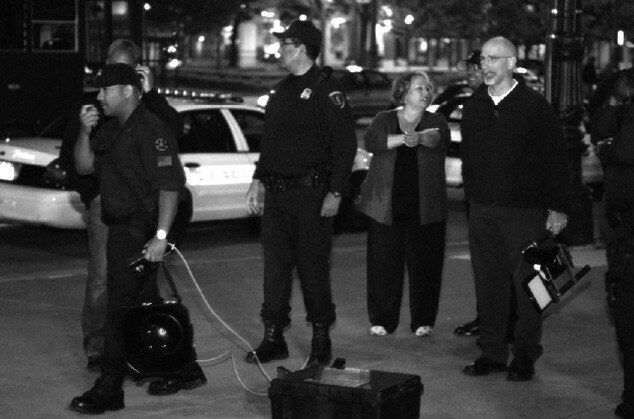 May Day – Officer Don Johnson gives first warning with the LRAD 100x. May 1st, 2012, Detroit, MI. May Day – Officer Johnson, Barb & the NLG. May 1st, 2012, Detroit, MI. In late September of 2011, my housemates Justin and Melissa had been urging me to get involved with this thing that, they claimed, had started to sweep the nation. They called it Occupy. What a stupid name, I thought to myself unenthusiastically. Yes, I was interested in social justice in a generic sense, but their explanations were not convincing me. You sleep in a park? Still not convincing me. I was not a particularly political person. I didn’t watch TV, listen to the radio, or read the paper. Politics existed on the periphery of my just-getting-by in Detroit existence. I knew the “system” was not working for me – a College for Creative Studies (CCS) college graduate with a huge school debt and a less than exciting financial future. I had never felt like I live in a just and equal country or world, but I was willing to put my nose to the grindstone and chip away at that school debt and socialize with other friends who were making Detroit work for them. Over the next weeks Justin and Melissa talked fast and hard enough so that on October 14th, 2011 I ended up in Grand Circus Park, downtown Detroit camera in hand, hoping to get a few good shots. We rolled in on bicycle, locked up and headed into the massive crowd of 1500 plus people. My skepticism was still intact as I began to wander, talk, and listen to the people in the park. I can’t point to one conversation or one aha moment that turned me. But by the end of the day, after overhearing and participating in innumerable conversations regarding social and economic justice, I was converted. I had a deep-boned sense that I had found my people, and that this movement really was going to change, if not the world, then . . . well . . . me. I went home that night to start organizing my schedule so that I could sleep in the park with my new found family. That day, everything changed. There was so much excitement, and more than excitement, there was hope: hope for a future not blighted by economic slavery or the structural racism that is so tied to our economic system of class entitlements. Over a year has passed since I first slept in Grand Circus Park. There were never hundreds or thousands there at night – at its peak, about seventy five people camped out. 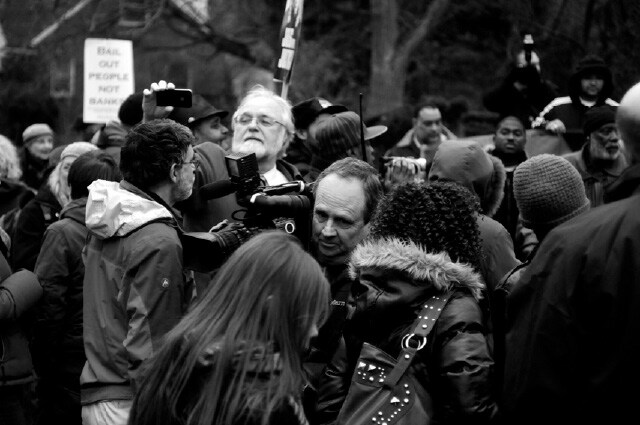 Those seventy five people were the core of Occupy Detroit. We entered the park on October 14th, 2011 and vacated on November 21st. Thirty eight days of wild and life-changing activities. Living in that environment was like trying to live in fast-forward. I would go home to shower, only to come back to a massive overhauling of the campsite. The camp was a living thing, rapidly expanding, evolving, and growing. On the first day the kitchen was a little 10 x 10 pop up tent. At its peak the kitchen was twenty times that size or larger, including massive prepping areas with industrial tarps tied to trees twenty five feet above the ground protecting us from the elements. It was, in a word, glorious. Resources from supporters were pouring in all day and night. People who could not stay all night came during the day to participate in the Occupy Movement in what ever way they could. Those of us that experienced living in the camp have become bonded for life. May Day 2012, the National Day of Action for Worker Rights, found Occupy Detroit marching the three miles from Clark Park to Grand Circus Park, our birthplace. There were speeches, activities, music, and overall good times to be had. We planned to end the night with a 24-hour temporary camp as an ode to our original occupation. The police, who for the original thirty eight days had given us an autonomous zone, made it clear that they would not permit a 24-hour campsite. At 10 pm, they rolled in and flexed. Twenty three police cars, over fifty police officers, a paddy wagon and the latest military protest-control equipment – the Long Range Acoustic Device 100X (LRAD), a hand held sound canon with an output of 137 decibels. About twenty of us stayed, determined to sleep in the park if we could. The police swept the park and gave us our warning. 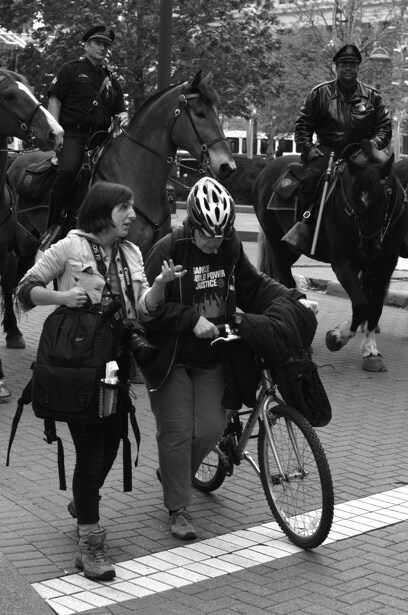 When it became apparent that the protesters were not going to listen to the initial warnings, Officer Don Johnson, the policeman charged with overseeing the Occupy protests in Detroit, approached us and pleaded that we go home. Which, thanks to Erik, an Occupy Detroit veteran and video journalist, we left. Erik probably single handedly prevented the arrests of our entire group. 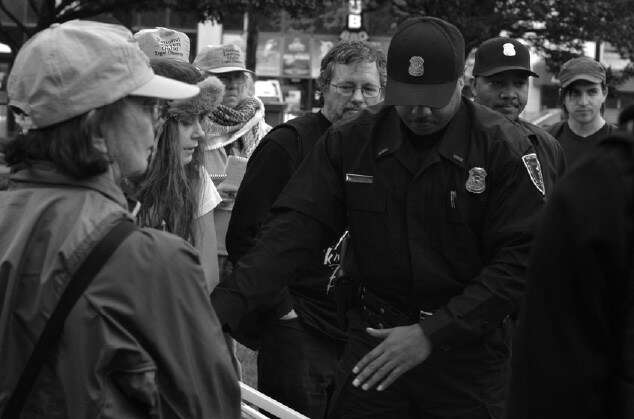 Recently files were released showing that the FBI enacted a coordinated strategic plan with state and local police around the country during the duration of the Occupy Movement, demonstrating that the mass arrests in New York and California in early Occupy months were an intentional scare tactic for Occupy Movements everywhere. Thousands of people were arrested and made examples of in order to keep the movement from growing in popularity. 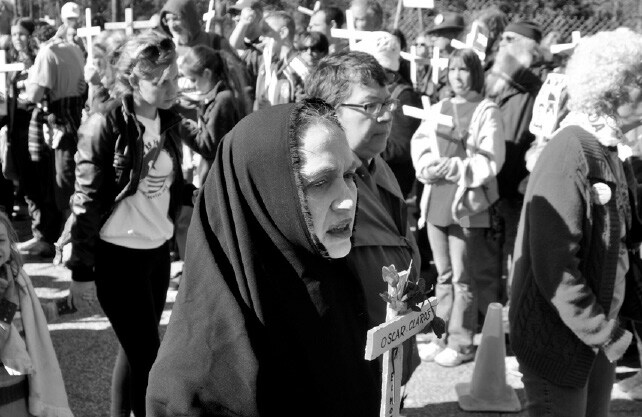 In Detroit we saw the scare tactics in action on May Day with the mass response the Detroit Police Department had to twenty people in a park for one night. Technology sometimes serves us well – we see all the new, top of the line products that make our lives easier. What we don’t see every day is the technology used for devices such as the Long Range Acoustic Device, something that can be turned on and used against small, peaceful groups of demonstrators to intimidate and injure. Over the past year I have marched, participated in non-violent direct actions, worked as both a volunteer and a professional organizer, and have travelled all over our country to assist in building long distance coalitions. I was in St. Louis when the police batoned several Occupy demonstrators bloody; in Charlotte, North Carolina, as a shareholder attending the Bank of America shareholder meeting; and in Lansing when our Governor and State Legislature showed contempt for the working men and women who pay their bills by making our state a Right to Work for Less state. I’ve stood with families in driveways, preventing evictions from moving forward, and cried with undocumented immigrants, who fought the order to be separated from their family and leave our country. I’ve sung union hymns and new anthems with the Occupy Choir, participated in teach-ins and lectures. You can’t participate in these things and not be changed, firmly, and forever. Today, a little over a year later, Occupy no longer is featured in the headlines; we are the 99% has become part of our lexicon, but many have written the movement off as dead. Do not be so foolish. 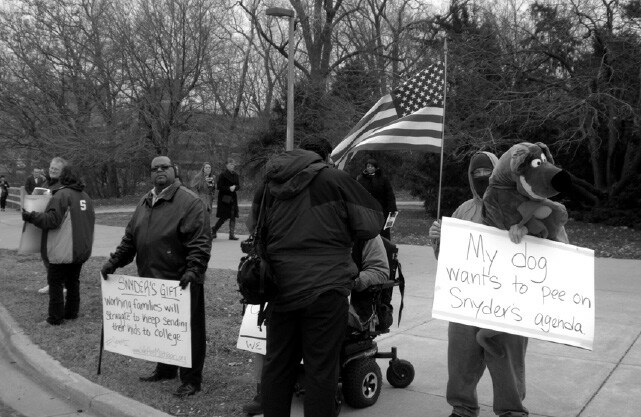 Those of us who experienced Occupy in its fullest forms will never again be who we were, and Occupy exists within the solid, determined hearts of those who work on the Occupy Detroit Eviction Defense committee – a very active group that has been successful on every eviction defense which they have taken on. Occupy veterans have created new organization such as This Hood of Ours, Plan it for Planet, the Occupied Detroit Free Press, and Free Detroit. While 5900 Michigan Avenue, once known as the 5900 Activist Center, holds only ghosts of the Occupy Midwest Regional Conference, and the many other activities that were held there, Occupy Detroit still holds regular General Assemblies (GA) at the 1515 Broadway Café, and while the group is smaller than a year ago, they are just as committed. Technology and Occupy are tied together. Occupy swept the nation because of the Internet and social media. Most power relationships we interact with daily are top down, meaning those at the top benefit from those at the bottom. However, the Internet doesn’t have much of a boss – yet. The Internet gives this generation an opportunity that our foremothers and forefathers in social justice did not have: we are the turning point that is the catalyst for horizontal power structures in the forthcoming Age of Information. The signifi cance of this point cannot be overstated, so let me say that again. Occupy, the Indignados, the Arab Spring, the fight against SOPA and PIPA, all the efforts and burgeoning movements of the last few years are the writing on the wall: a global will exists to transition from power-over systems to power-with systems, and we currently have the tools to bring that dream to fruition. Detroit’s current political state is ripe for this fight. It is unique in its geographical location, being the only industrial city alongside the greatest source of fresh water on the planet, with an international boarder with Canada. It is also unique in its lack of functioning infrastructure and law. In the 2012 general election, Michigan faced and surprisingly defeated the Emergency Manager Law PA4, which would have taken away our ability to publicly elect offi cials. That would be dictatorship, plain and simple. There are blatant corporate land grabs occurring around the city. The Huffington Post reported that Detroit is considering a one billion dollar proposal to turn Belle Isle into a commonwealth, with its own currency, its own laws, and could house up to 35,000 people. A more recent land grab was Hantz Farms, which purchased one hundred and seventy acres of Detroit land for $586,800. Then there is the Detroit Fairgrounds, which sold for a whopping $1.00 for a shopping mall. 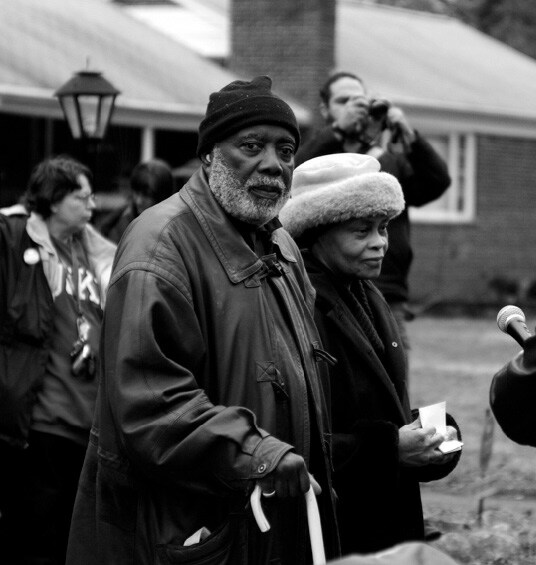 Detroit is also the city where residents are turning to their own communities to solve problems such as access to affordable healthy food through urban community farms, owned by the neighbors who work them, and locally organized neighborhood watch programs. Those of us who live in Detroit see the world positively change around us by our friends and neighbors every day. And here, among these challenges, Occupy still exists, doing what it has done in the past: Getting in gear, doing the groundwork. Fighting. This year the National Occupy Gathering will be in Kalamazoo, Michigan on August 24-26. I, and others in the movement, will be there, determined to carry on. 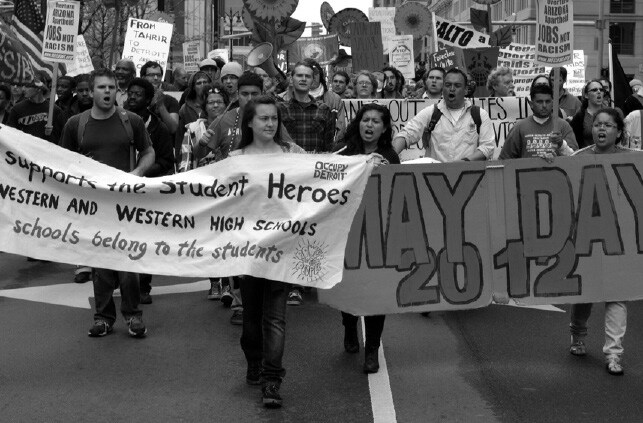 May Day – Three Mile March. May 1st, 2012, Detroit, MI. Gov. Snyder Receives honorary doctorate of laws from MSU – Dec. 15th, 2012, Lansing, MI. Durbanville – Pop Up Shanty Town and Soup Line. 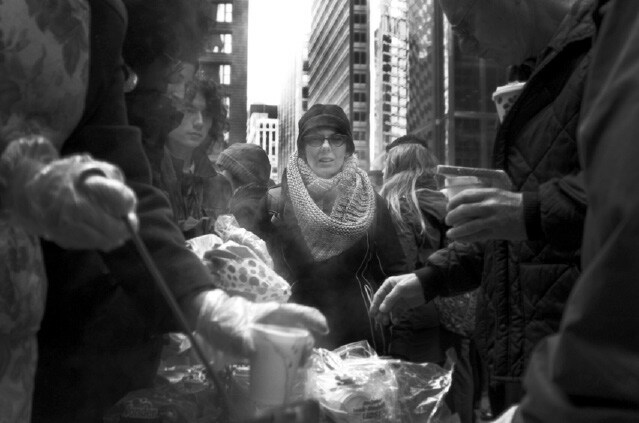 Dec. 6th, 2012, Chicago, Illinois. 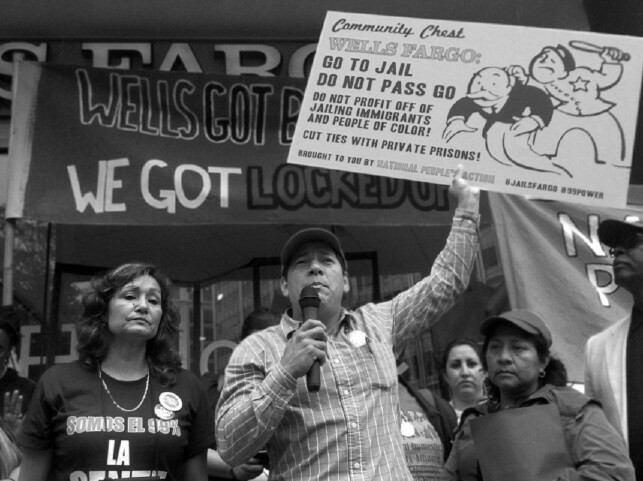 Eviction Defense Rally – The Crowd. Jan. 31st, 2012, Detroit, MI. State rep. Rashida Tlaib speaks – ICE takes undocumented parents while they drop their kids of at school. Oct. 17th, 2012, Detroit, MI. Occupy Detroit, Experienced was written in late 2012.